It's Earth Day! Join Biscuit as he helps take care of our green world. 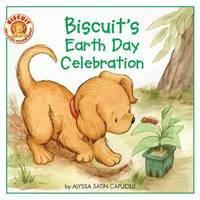 From planting seeds to cleaning up, Biscuit's celebration is an exciting adventure for Earth Day and for every day! Woof! Have more fun with Biscuit! Alyssa Satin Capucilli is the author of the first story about Tulip and Rex, Tulip Loves Rex, as well as the bestselling Biscuit books and many other beloved children's books. She lives in a book-filled home in Hastings-on-Hudson, New York. Pat Schories's engaging illustrations of the puppy Biscuit are modeled on her own dog. In addition to having illustrated all the Biscuit books, she is also the artist and author of He's Your Dog and Mouse Around. Ms. Schories lives in Cold Spring, NY.